At the foot of the Harz Mountains a historic ice stadium has been renovated. 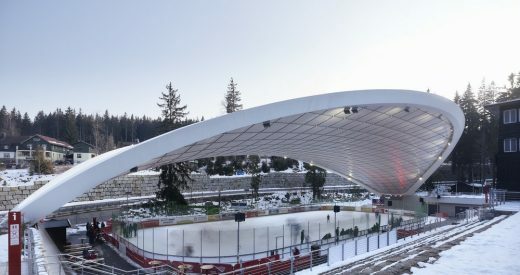 In 2013, GRAFT won the European architecture tendering for the reactivation of the former natural ice stadium and convinced the jury with their unique roof construction. The exhibition responds to current debates on nations, protectionism and division and explores the effects of division and the process of healing as a dynamic spatial phenomenon. The URBAN NATION MUSEUM FOR URBAN CONTEMPORARY ART, in short Urban Nation Museum, is the first German museum for urban art, built in the Berlin quarter of Schöneberg. The Hotel occupies an advantageous position in its natural surroundings, overlooking a serene lake from a wooded promontory. GRAFT’s design aims to build on and enrich the character of the location. The building figure is a product of the surrounding topography. 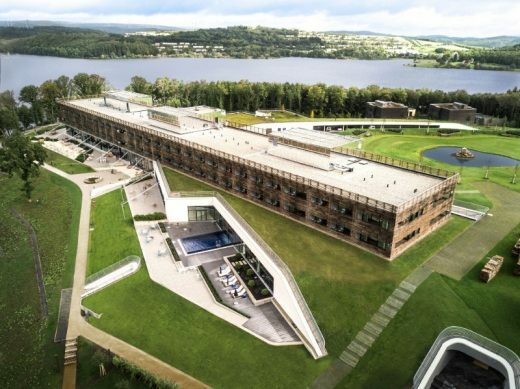 The hotel connects the realm of the wood with the expanse of the lake, mediating between the land and the water. Covering over 500 pages, Birkhäuser’s new book GRAFT – Home. Story. offers a broad insight into GRAFT’s highly diverse “four walls”, showcasing permanent and temporary dwellings from detached houses to tower blocks and ultimately mansions and luxury hotels. GRAFT’s architecture reveals a sense of insatiable curiosity and eagerness to experiment – all the while foregrounding the unique aspects of each project and thus also the development of highly disparate spatial concepts. PLATOON KUNSTHALLE is designed as an experimental space for artists and creatives, and for the members of the PLATOON NETWORK. The KUNSTHALLE hosts art projects, workshops, and events. It also presents a multitude of creative and artistic projects that clash with the regular art-institutions. With more than 11 million hectares of woodland, Germany is one of the most forested countries in Europe. Now another tree has taken root in the Heinemann Duty Free shop in Frankfurt. The architect’s office has brought a flavour of the forest to the regional products area – with an installation that is Made in Germany. 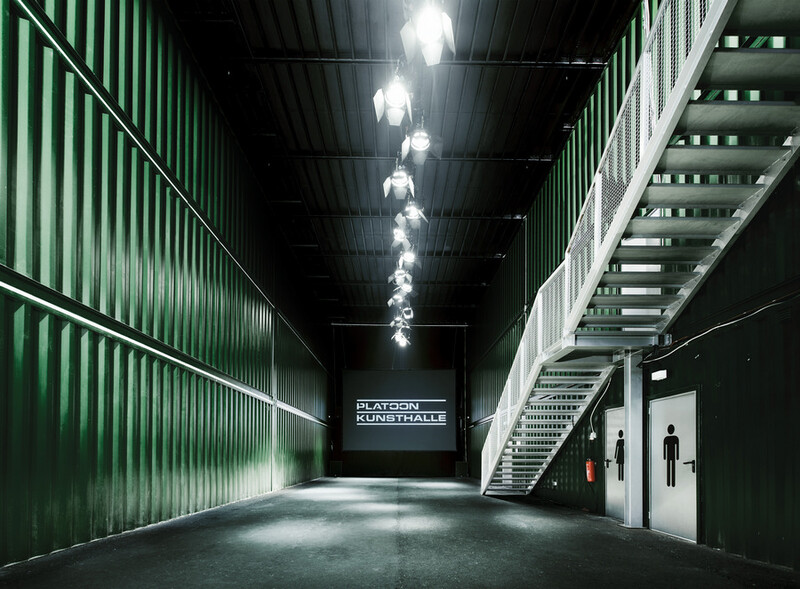 The firm was commissioned to remodel a former parking area on the site of VW Autostadt in Wolfsburg, Germany. The task was to create a quiet area where the buyer of a new car could get familiar with all the functions in an almost private atmosphere. The space had to be protected from rain and direct sunlight, while allowing enough daylight to avoid the usage of energetically expensive and unnecessary artificial light. Architecture must improve our lives, not just in a functionally or artistically precise way. While searching for quality and beauty, complex shape and ambiguity are part of the essence of architecture that transcends the accurate and the distinct. City Center is a mixed use, 18 million square feet, development by MGM Mirage that features buildings by several world renowned architects. The unique seventy-six acre urban resort is located in the heart of the famed Las Vegas Strip and is a collection of luxury hotels, condominiums, casinos, shopping facilities, and entertainment venues. To date, it is the largest privately financed development in the history of the United States and is also the largest LEED Certified project in the world. By April 2009 a total of 6 houses have been finished as part of the Make It Right Program in the Lower 9th Ward, the owners were able to move back and enjoy the benefits of their new homes. Two of these houses were designed by this architecture firm and chosen by the homeowners, as the process at Make It Right is individual choice of the design. 9 more houses are currently under construction, one of them also designed agai by this studio, 10 houses are in the permit process. GRAFT is a full service architectural firm with the collective professional experience that encompasses a wide array of building types including Fine Arts, Educational, Institutional, Commercial and Residential facilities. The firm has won the Honor Award 2005 from the AIA in Los Angeles, the Contract World Award 2005 and 2004, the Hospitality Design Award 2005, along with numerous other international awards and prizes. This architectural studio was conceived as a Label for Architecture, Urban Planning, Exhibition Design, Music and the “Pursuit of Happiness”. Since the firm was established it has been commissioned to design and manage a wide range of projects in multiple disciplines and locations. With the core of the firm’s enterprises gravitating around the field of architecture and the built environment, the architecture studio has always maintained an interest in crossing the boundaries between disciplines and “grafting” the creative potentials and methodologies of different realities. 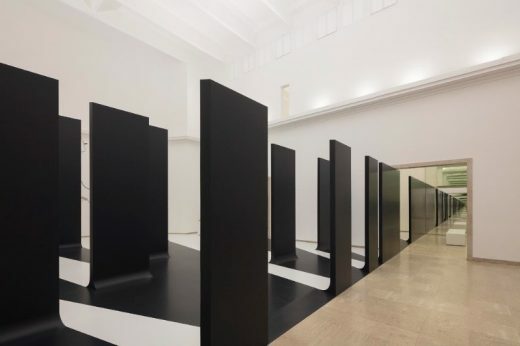 This is reflected in the firm’s expansion into the fields of music, car design, art installations, academic projects and “eventings” executed by their in house production department as well as in the variety of project locations throughout the globe. January 16, 2019 in Architects.